For the late 2013 season — The Alternative auto 2011 5.0L GT ended up with a Forged bottom end, and a few more tweaks to get a little more HP out of it. 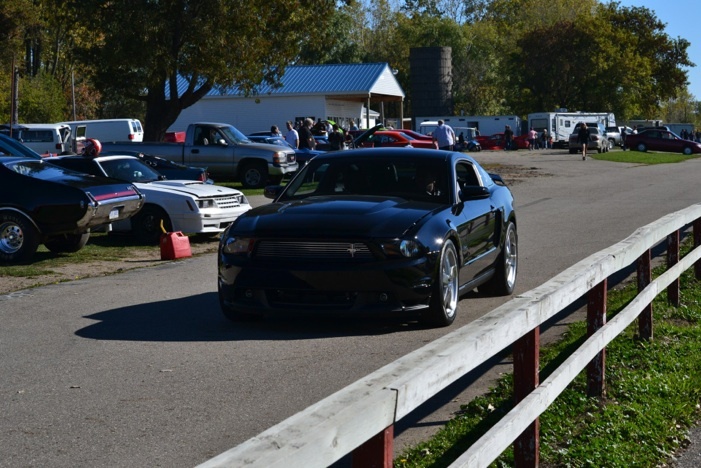 During an all Ford event at Norwalk Raceway in June of 2013, our coyote equipped GT suffered an oil pump failure at the end of a ¼ mile pass. This is known problem that can arise on these motors when they have stock oil pumps and short blocks, when they start to get well over 600+ RWHP and turning past 7000+RPMs regularly (like ours). We believe that harmonics in the crank, and blower drive load, negatively affected the crank driving oil pump. And because the oil pump gears in the Coyote’s are still made of weak powdered metal, we believe they can’t take the abuse of extended RPM combined with big power gains for very long. As great and as strong as the new coyote’s are, stock components can only take so much! So our 5.0L car suffered some down time mid summer of 2013 as we waited for parts to come in, and our shop experienced a very busy season throughout 2013… so the shop owned cars tend to get put aside a little. Our 5.0L GT did come back to life in September of 2013. What we did for the Forged short block was keep it simple and cost effective. For connecting rods we used off the shelf Manley H-beam rods, and we only use Diamond Pistons for all of our piston and “custom Piston” needs. So our coyote ended up with a .005 over Diamond piston that had a slightly bigger then factory dome, and we decked the heads about .030. We did this to intentionally raise the compression to about 11.3 to 1 (stock is 11.00). Knowing that we will continue to only use e85 in the car (105 octane), and that it’ll probably not see over 15-16psi anytime soon. We felt that a slight bump in compression would help make up for the heavier piston and forged rod combo. The days of low compression and boost are gone for us. With today’s intercooling, high octane (if being used), and proper tuning with A/F and spark. Moderate to big compression and boost are a marriage made in heaven when done correctly. Lowering the compression on these has been a failure, and kills performance most of the time. And also to stay cost conscious; we didn’t change the cams, or not to much else in the motor. We even were able to re-use the stock main bearings, and of course the stock crank is steel so we left it alone. Other then fresh gaskets and new head bolts, we kept the forged build for this coyote as affordable as we could. The only other thing we did change was of course the oil pump to a new unit equipped with billet gears. Knowing that the motor was going to end up stronger and forged, we also decided to make a couple of efforts to bump up the power some. And all we did here was a VMP inlet elbow for the Roush TVS blower and a larger twin-bore throttle body. These two components bumped the boost about 2psi. Putting us at about 14-15 total boost out of the 2300 TVS unit. Plus with a forged motor we got a little more aggressive with the ignition timing and bumped it for a little more advance. 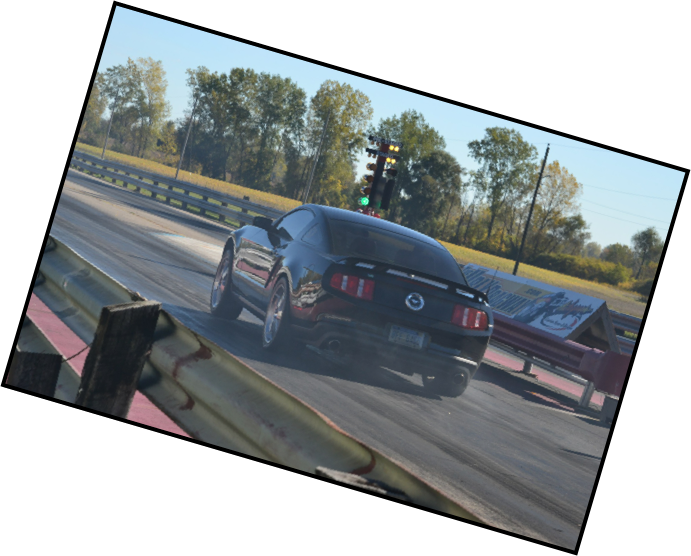 In all this bumped our 2011 Mustang 5.0 to 709 RWHP in normal Michigan weather conditions which were about 80 degree outside temps at the time. The stock non-forged motor left off at about 680 RWHP. The new HP numbers did not unfortunately put the car into the 9’s in the ¼ mile like we had hoped. In the fall of 2013 the best we got was a 10.15 @ 137mph. We chased poor traction at the end of the season as the track conditions got colder, so we never even got under a 1.50 sixty foot. We were in the 1.48s when it was a stock motor. Even with poorer traction, we did improve the ET and MPH substantially with the roughly 30 more RWHP out of the forged motor with a couple of add-ons. And as I always remind this is with the car at nearly 4000lbs with driver and on 20in wheels on all four corners. Our 6-speed automatic car is now at 709 RWHP on 14 psi of boost, Forged.